Creates synthes with your own stem cells? The human-made music is fed to the neurons as stimulation, and the neurons respond by controlling the analogue synthesizers, and together they perform live, reflexive and improvised sound pieces or “jam sessions” that are not entirely human. cellF can be seen as a cybernetic musician/composer. 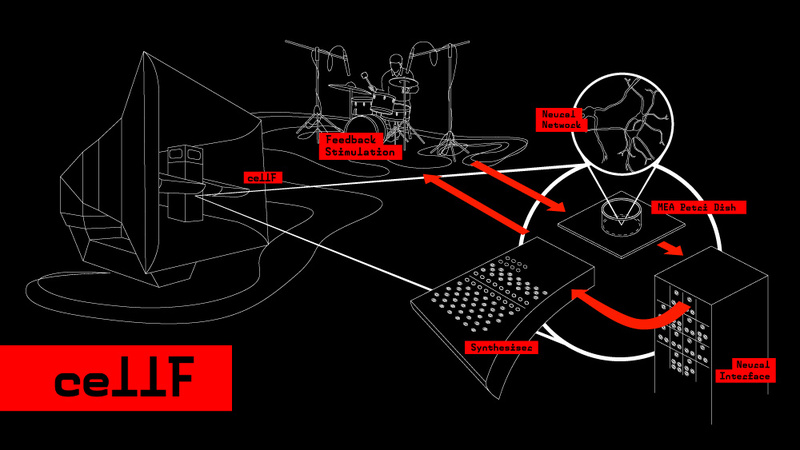 The artwork is performative, where human musicians are invited to play with cellF in special one-off shows. This is the 1st time we connected neurons to a nonlinearcircuits voice synth. The neurons are grown on an array of 60 electrodes. In this test we just used 1 electrode and amplified the signal to get a 5V neuronal noise signal and extracted the action potential using a comparator to get triggers.